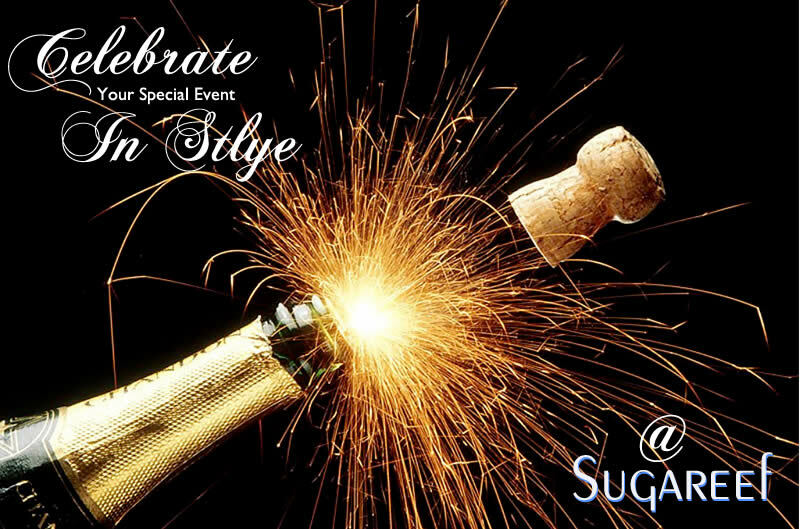 Celebrate your special event in style at Sugareef. The perfect venue to celebrate a big occasion, product launch, corporate event or Christmas party. Exclusive hire is absolutely free of charge providing you purchase a buffet for each of your guests. Please check out our menu and if there is something you really fancy that's not there simply just ask, we’re sure our Chef’s can help. We can also arrange Prosecco, Cocktails & beers for the boys on arrival. The team at SugaReef are here to make your night go exactly how you would like it too. We are licensed to 1.30am and have a capacity of 100 people. We have a internal P.A system for you to connect you ipod, numerous hanging disco balls and lights, there are several flat screen TV's to play slide show pictures of your friend, family member or work colleagues embarrassing moments or great to display company logos. We have a vast knowledge in local entertainment so please feel free to ask. There is a fantastic dance floor area with a bar, booth seating and small stage in the upper area and dining tables and sofa’s with access to the terrace in the lower area of the restaurant. Our location speaks for its self. To secure your exclusive party you need to book for a minimum of 65 guests and we would need a 50% deposit. To enquire simply send a email to info@sugareefjersey.com with the info below !!! Date. Time. Name. Contact Number. Email. Guests. Entertainment. Additional. We will check our availability and come straight back to you. *This field is required. *Please tell us the date of the event in numbers. *This field is required. *Please tell us the number of people expected. Anti-spam test: 4 + 4 = *This field is required. *This is not a valid number. Special Offers and Forthcoming Events.